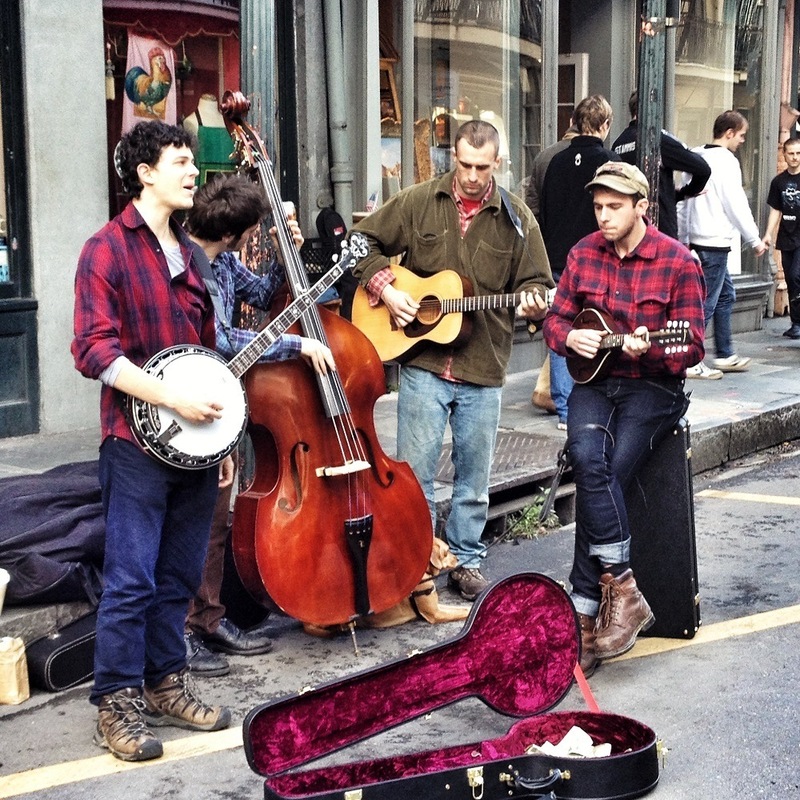 New Orleans hums with a liveliness that few other cities have. Everyone there seems to be in search of fun in different forms, and it would be hard to leave disappointed. The food and drink of the city are distinctive and more than a little over-the-top. Music and football are religions. And religion is, well, colorful. There is a reason that the city’s motto is laissez les bon temps rouler (let the good times roll). It is entirely possible that I am biased. My grandfather is from New Orleans and my mother was raised in northern Louisiana, so some ways, this city feels like a part of me. Recently, we took a cruise out of the Port of New Orleans and had a little bit of time to spend in the city once we got back. 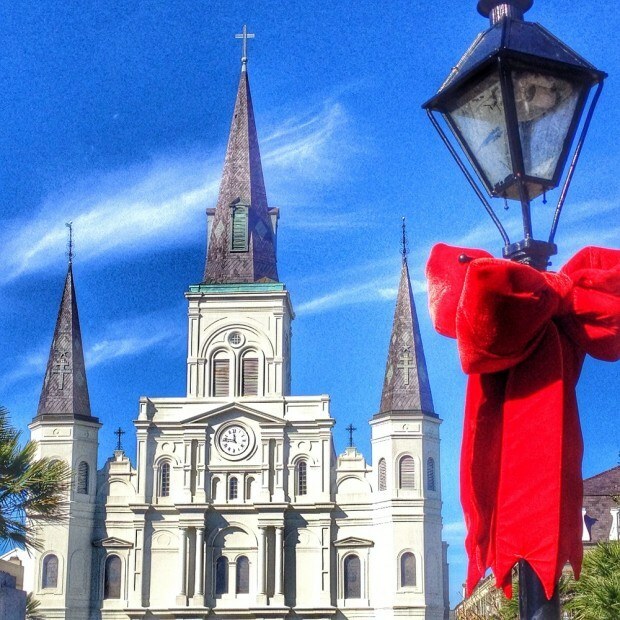 Though photos of New Orleans can hardly do it justice, here’s a look at our time there as seen through Instagram. New Orleans foods is unlike that in any other place in the US. It reflects the city’s location on the water (seafood) and in the South (fried!) as well as its Cajun heritage (spicy). On Sunday afternoon, we found ourselves looking for a snack and stopped into a promising looking restaurant on Bourbon Street called Desire (we’re in New Orleans, remember). 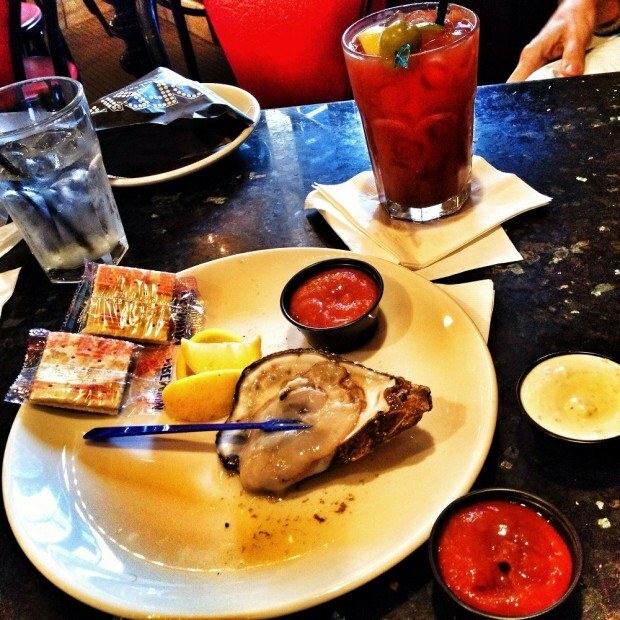 When we told our server that Lance had never had a fresh oyster, she couldn’t let that stand. Along with a great Bloody Mary, she brought his first ever freshly-shucked oyster on a half shell, complete with an amount of horseradish that could clear your sinuses. Amazing. 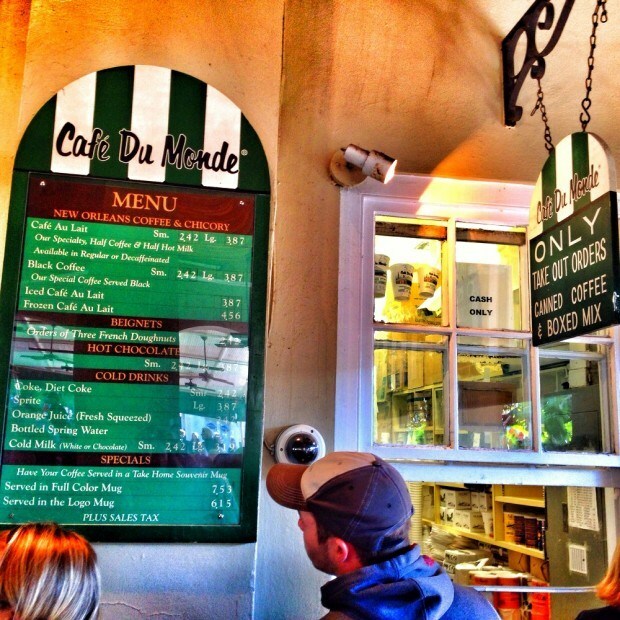 Despite a line that wrapped around the block, it was impossible to pass by Café du Monde without stopping. Our first stop off the boat was for beignets (fluffy, piping hot doughtnus) and café au lait at this New Orleans landmark. New on this trip, we also tried their hot chocolate for the first time, which was creamy and perfect on a winter day. New Orleans and partying are almost synonymous. Even outside of Mardi Gras, the French Quarter is filled with revelers at all hours in the day. In the morning, it’s not too hard to identify the people who never made it home the night before. A key culprit in the all-hours partying is the famous hurricane. 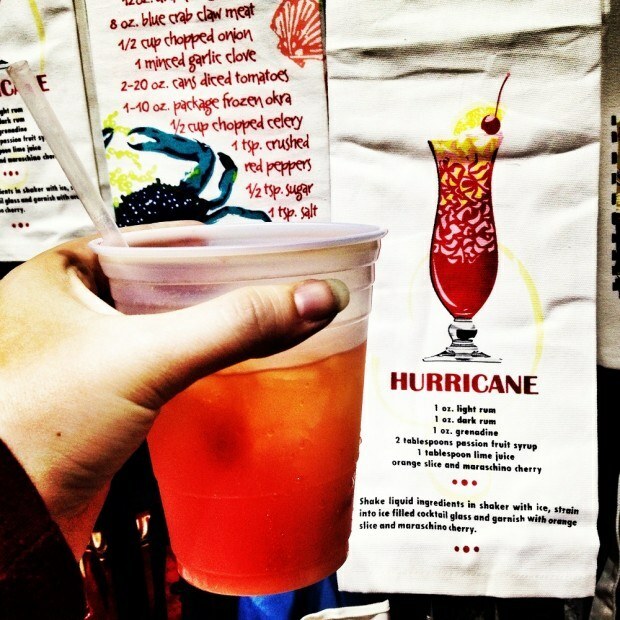 Conceived at Pat O’Brien’s during World War II, the hurricane is rum-based goodness. It’s potent. Drink it slowly. Really. Music — especially jazz — is everywhere in New Orleans. From jazz brunches and clubs to the middle of the pedestrian area, professional musicians and buskers entertain visitors. “Who dat?” is not only emblazoned on t-shirts and a common refrain in the street on game day, it’s a defiant philosophy for all those who love their Saints. And love, they do. As we drove through downtown on game day, tailgating was already getting underway at 10am. As we walked through the French Quarter, everyone seemed to be proudly sporting black and gold. The game and the cheers and groans of the fans poured forth from every bar. It’s OK to be fans of another team here — just don’t tell anyone. While football, partying, and music seem like religion in New Orleans, actual religion is prominent too, though not always in a traditional way. The St. Louis Cathedral, the oldest continually operating cathedral in the US, was first built in 1718. It’s been expanded and rebuilt a couple of times since and now dominates the landscape. 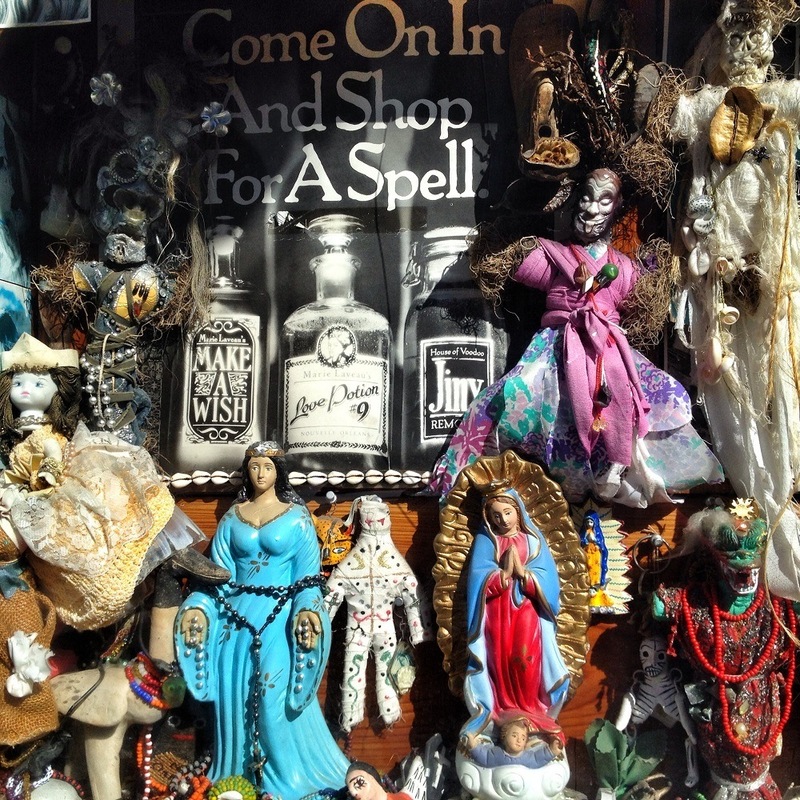 A combination of Catholic beliefs, French culture and African folklore, voodoo has also played a part in the history of New Orleans. 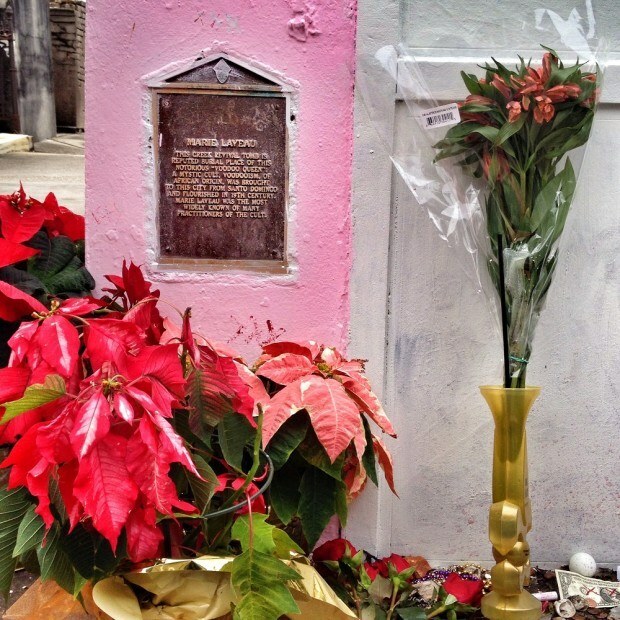 The legend of Marie Laveau, voodoo priestess, and the public rituals she performed is still very much a part of the lore of the city. Today, visitors can find shops selling voodoo dolls, tarot cards, and spell books. Despite her role in voodoo, Marie Laveau was officially Catholic. As such, she was allowed to be buried in the Catholic cemetery, St. Louis Cemetery No. 1. Legend says that visitors should mark an X on her tomb and ask her for to grant a wish. When it comes true, they are supposed to return to circle the X. Just before our visit, the tomb was painted pink by a vandal likely trying to cover up all the Xs. St. Louis No. 1 includes more typical tombs, too. The stories of the people buried here and how they fit with the history of New Orleans are told on some of the city’s famed cemetery tours. We had a chance to take one on this visit. 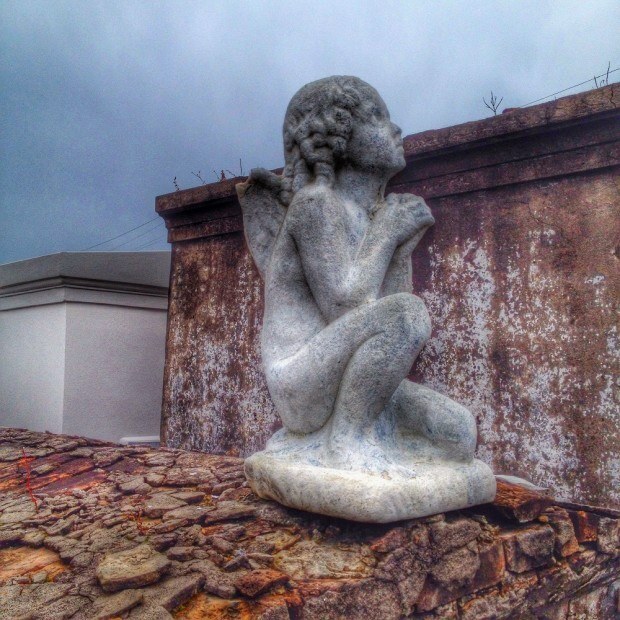 What do you think about Distinctively New Orleans — Photos of the Big Easy? New Orleans is such a photogenic city, isn’t it? Love your captured moments! I’ve always wanted to go back to New Orleans! 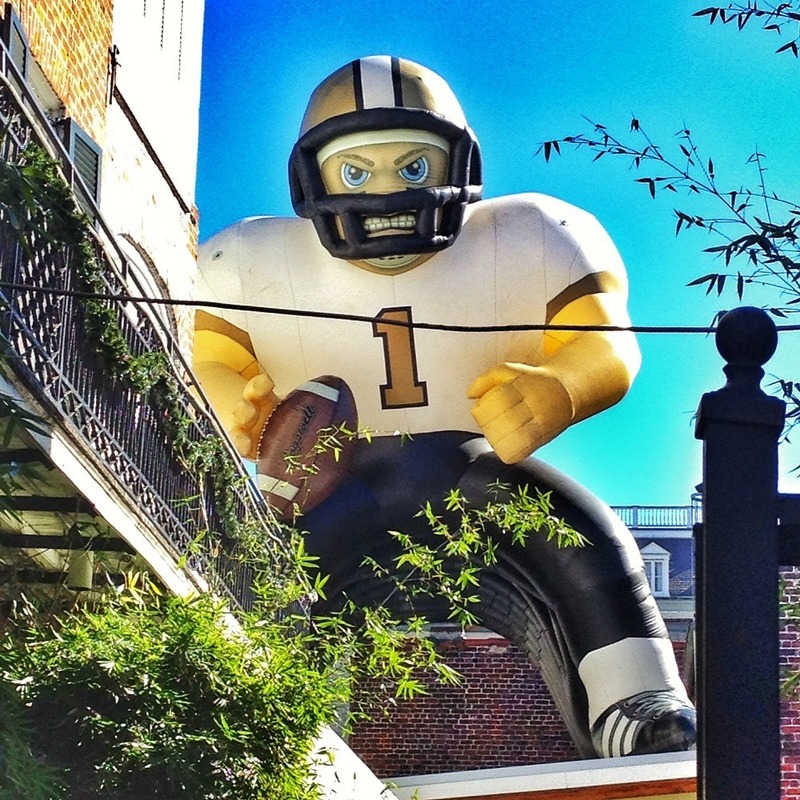 I was only there once for work… I love how the city has rallied around the Saints. And I would love to see the cathedral and cemetery! Definitely give it a shot when you have the time. It’s a really unique place. I really need to make it to New Orleans. It’s a great place. I think my barrier to moving there would have to be the humidity, though. I am dying to get there! The food looks amazing and a ghost tour of the cemeteries would be right up my alley. We absolutely love New Orleans. 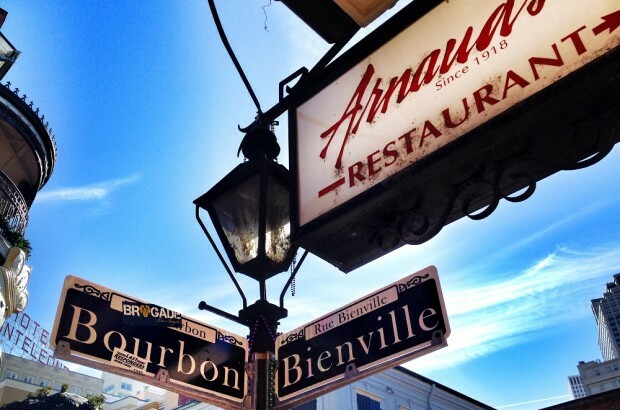 You’ll have to be on the lookout for our other New Orleans posts coming soon! I have never been to the Big Easy and really want to go! 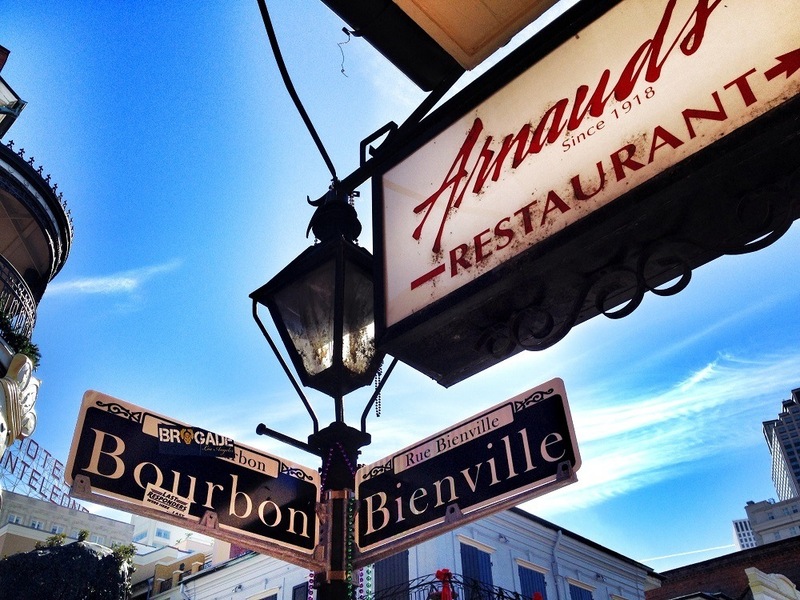 This post has me really excited for my upcoming trip to NOLA! Of course it will be Mardi Gras, so things might be a little more hectic than shown in these photos! We can only imagine what New Orleans would be like during Mardi Gras. Wicked food there on the second photo, by the way! Fantastic photos! What a photogenic city. I’ve never been, but I suspect I’d quite enjoy New Orleans. It really is a beautiful place with a flavor all its own.